A one night, one party movie set in the eighties that comes off like can’t hardly wait meets the wedding singer. Take me home tonight is not a bad movie, but it’s not very good either. it’s meant to be a comedy, but the jokes aren’t really all that funny. especially when you consider the gravity of what’s happening, and how the movie treats these things as if they’re nothing (Example: breaking into a dealership and stealing a car.) the movie wants to be everything at once, both a drug infused criminal movie and also a teenage party movie, and the combination doesn’t quite work. like can’t hardly wait, take me home tonight centers around a one night party. also like that movie, our hero’s only goal is to get with the girl of his dreams. she’s the girl he’s always had a crush on, for years while they were in high school in many of the same classes together. and now it all comes down to this one night. that’s the premise, and we’ve seen it before, but this movie tries to add a few original touches into the mix. the first, and most obvious new touch of this movie is to put it in the eighties. in that sense, it goes for a kind of wedding singer / hot tub time machine vibe. and it kind of works. the colors and outfits and attitudes of the college grads involved (they’re not really teenagers, even if they act like they are), are all worth making fun of. there’s a lot of cocaine use in this movie and a pretty decent 80s soundtrack. but none of those things make for a good movie, they are just nice little background touches. What does work for the plot is a storyline about how the main character, matt Franklin, (Toper Grace), doesn’t know what he wants to do with his life. He’s an MIT. Graduate, and yet he’s working at a Suncoast Video store in the mall. Everyone in his graduating class thought he would be most likely to succeed, being an absolute brainiac and mastermind with number calculations, and yet he hasn’t moved passed the kind of job that a high school student would be working at after school. This storyline is a nice bit of creativity, especially with matt getting talks from his dad (Michael Biehn) about it, and how disappointed his dad is. But the problem is matt never really explains why he doesn’t want to do anything with his M.I.T. education. he’s okay being average and just coasting along, but why does he have no drive? he doesn’t want to answer the questions about where he sees himself in the future, and so he doesn’t. in that sense, the movie kind of takes the same approach that he does, not giving us answers to why he is this way and what he’s thinking. Matt’s employment storyline is hardly the main point of the film. Instead, it really goes for the one night at a party structure, with matt pursuing Tori Frederking, his longtime crush. 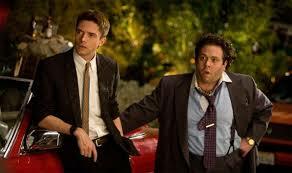 He’s accompanied by his sister, Wendy (Anna Farris) and his best friend, Barry (Dan Fogler.) Barry is the fat guy comic relief. sometimes he’s funny, sometimes he’s not. he’s certainly more funny than anyone else in this movie. in fact, he’s the only character that is occasionally funny in the entire film. Topher Grace is pretty boring. As an actor, he seems like a nice guy (he came out and presented the movie to the theater I was watching where I was watching an early premiere, in Chelsea, Manhattan), but he just doesn’t have that spark that great actors have. he’s very average. maybe it’s because the roles that he’s taken have brought him nowhere fast, from spider man 3 to valentine’s day. or maybe it’s because he just has bad luck, so that when he does make a good movie, like in good company, (what a terrible title), nobody goes to see it. part of the problem is that this movie tries too hard to stick to a formula. if there’s a lie, for example, then by the end it’s got to come out, and the character has to be honest. considering that it’s all just one night, telling the truth right away might be jumping the gun just a little. especially right after you’ve just finished sleeping with the person. there’s an interesting climax involving a giant ball, and a funny moment involving a bathroom voyeurism scene, but most of this movie is uneventful and easy to forget. the biggest problem about it is that it feels like something we’ve seen before, again and again. the attempts at making it unique don’t really work as well as they should. that’s because these ideas might look good on paper, but when put into practice, they do little to divert this movie from the usual path. We should have spent more time in the character’s homes, instead of in neighbor’s backyards on trampolines. and the major events that happen, such as robberies, cocaine busts, or huge car crashes, are just shrugged off, as if they’re nothing at all. instead of bringing his son home and scolding him after one of these events, for example, a cop father just brings his son right back to the party. with no consequences, this movie feels ridiculously fake. yes, some of the jokes and story ideas work, but in the long run, this movie doesn’t have a whole lot to offer.